Spring break is a time that harkens back to long drives to the coast for a quick couple of days in the sand, sea and sun. And then a long drive back home just in time to get back to work. Now while such whirlwind trips were something of a rite of passage for high schoolers and college kids, as adults with families who have slower recovery times from highway fatigue, there’s a lot to be said for finding fun destinations that aren’t so far away and expensive to get to. For this blog, I compiled a short list of destinations close to bossier that are perfect for quick family getaways during spring break. If you’re a fan of history, scenic streets, charming landscapes, and historic homes;then the town of Jefferson, Texas is a great destination. 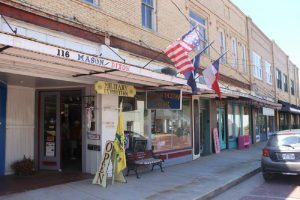 Located about 16 miles north of Marshall, Jefferson is nestled in the heart of the Piney Woods of East Texas. The city boasts over 70 historic landmarks, restored buildings, museums, churches and well-preserved homes, some available for tours and a perfect weekend getaway. If you’re looking for unique lodging in Jefferson, several historic homes have been beautifully restored as Bed & Breakfasts. There’s the historic Excelsior Hotel which was established in the 1850’s back during Jefferson’s heyday as a thriving riverboat port and was owned by a steamboat captain. Famous people including U.S. Presidents have stayed at the Excelsior. For families seeking more modern accommodations, motels are nearby, not far from downtown. The downtown area offers several restaurants and cafes ranging from casual to fine dining. Shopping opportunities run the gamut from boutiques to antiques. You can also find an assortment of retail establishments throughout the downtown of Jefferson. While Jefferson is a small town, there’s nothing small about the list of attractions and things to do while visiting. In addition to touring the historic area, there is the Jefferson Courthouse Historic Museum that offers the history buff an easy time browsing the displays and collection of artifacts from a bygone era. The Atalanta Rail Car is on permanent display downtown that once belonged to railroad magnate Jay Gould who once planned to bring a railway to the area but left in a huff and left his personal rail-car behind. In fact, you can relive an authentic old fashioned railroad experience with the historic Jefferson Railway which kicks off it’s spring season in mid-March. Nature trails and bayou tours are available, you can take a boat tour of Big Cypress Bayou and get a close look at this natural wonder. For a more engaging experience with nature there are bike trails, kayak and canoe rentals, and even fishing available at a nearby pier. Jefferson, Texas is just 54 miles from Bossier City, take I-20 Westbound and exit at Marshall, Texas on US 59 North. Drive approximately 17 miles and turn right at FM2208 (See signs for Farm to Market Road 2208). Continue on FM 134 and turn left on Lafayette Street and you’ll be in the heart of Jefferson. 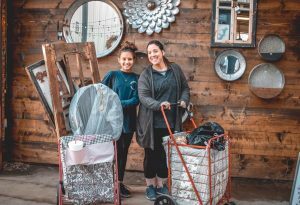 They say everything is bigger in Texas and that’s certainly true when it comes to flea markets. 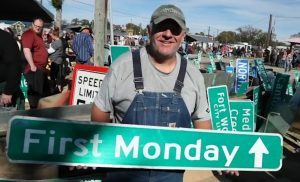 Head west on I-20 past Tyler and you’ll come upon Canton, Texas which is home to First Monday of Canton billed as the “World’s Largest Flea Market.” The story goes it all began in the 1850’s when the circuit judge stopped in Canton to hold court on the first Monday of each month. Now anyone who had business before the court would be there and along with those proceedings came people to conduct commerce as well. This was an ideal time for people to trade goods, everything from produce, livestock, anything that could be bartered in trade or sold for cash was brought to Canton each first Monday when the judge came to town. And so through the years the tradition stuck. It used to be that First Monday only happened on the first Monday of the month, the market grew so large and so popular that it was decided to retire the day Monday from the calendar and hold the market Thursday through Sunday. And so became First Monday Trade Days. The market opens sun up and goes until sun down and is open rain or shine. The market hosts over 5,000 vendors selling just about anything you can imagine. You’ll find crafts and collectibles, computers and high-tech, clothing to cameras, home decor and accessories. There’s just no shortage to what you might find browsing acres and acres of vendor’s booths and stalls. Shoppers are encouraged to wear comfortable shoes and bring a small shopping pull cart or wagon for the purchases. For anything larger, you can ask the dealer for a pass to drive on to the grounds in your vehicle to pick up your purchases. While an outing to First Monday Trade Days is a great experience for the whole family, it can be a long day for first-timers and the littlest members of the family. So make sure you have a stroller handy for the little ones. Also, an umbrella is a good idea for shade against the sun, heat and the rain when it happens. From Shreveport-Bossier, take I-20 west and drive 131 miles, take EXIT 526 and drive to Edgewood Road. You can’t miss it, follow the signs. 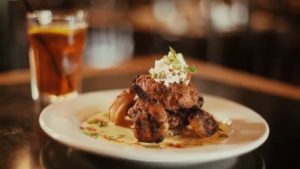 But if you’d rather stay in Louisiana and want to get a feel for the charm of an original French colony, then head south on Interstate 49 to Natchitoches, Louisiana. Established in 1714 by French explorer Louis Juchereau de St. Denis as part of French Louisiana, the community was named after the indigenous Natchitoches people. The City of Natchitoches was not incorporated until after Louisiana had become a state in 1812, on February 5, 1819. It is the oldest permanent settlement in the region. Today the city still retains its European charm through its buildings, heritage and lifestyle. 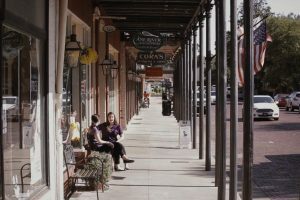 The historic downtown of “old Natchitoches” is situated along the Cane River. Here a visitor can find a 33-block landmark district full of shops, restaurants and cafes. Shop the authentic Kaffie Frederick General Mercantile, the oldest general store still in operation in Louisiana. Stroll over to any number of cafes or restaurants and sample the famous Natchitoches meat pie. Natchitoches can also boast as being the “Bed & Breakfast Capitol of Louisiana” with over 35 inns offering more than 125 rooms that run the gamut from rustic to elegant. Many of these are historic homes and a short walk from the historic district. The Cane River which runs through historic Natchitoches also continues throughout the countryside and The Cane River National Heritage Area Trail is so designated which includes plantations that are open daily along the Cane River Road including Melrose, Magnolia, the complex at Magnolia Plantation which is referred to as the Cane River Creole National Historical Park and the newest addition: the National Park at Oakland Plantation. You can rent a pedal-powered watercraft or paddle board, visit Louisiana’s Sports Hall of Fame and Northwest Louisiana History Museum, or witness any number of activities that go on every week, check the activities calendar online with the tourism office. Or simply grab a cool beverage and just watch the world go by at any one of the establishments on Front Street.